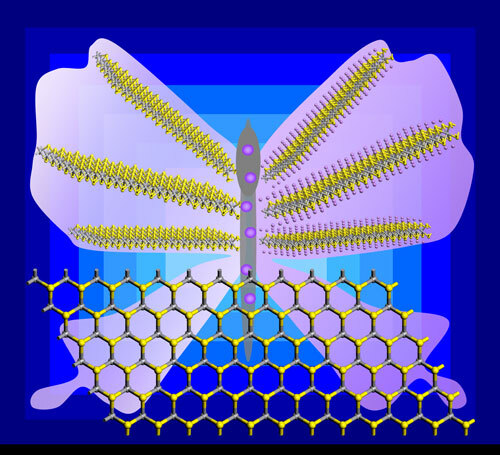 (Nanowerk Spotlight) As researchers continue to develop the use of graphene in energy storage devices, other two-dimensional (2D) inorganic materials like 2D transition metal disulfides (TMDs) have attracted extensive scientific attention. So far, the investigations of 2D TMDs have focused mostly on MoS2, WS2 and SnS2. However, these 2D TMDs are all semiconductors and their poor conductivity has limited their electrochemical performances to some extent. Their applications in lithium-ion (Li-ion) batteries are usually combined with the additive of conductive carbon materials such as graphene, which however will decrease their gravimetric capacities. Therefore, metallic 2D TMDs are highly desirable. Since vanadium disulfide (VS2) few-layered nanosheets have been recently achieved experimentally ("Metallic Few-Layered VS2 Ultrathin Nanosheets: High Two-Dimensional Conductivity for In-Plane Supercapacitors"), researchers have been motivated to examine the feasibility of using VS2 monolayer anode for effective lithium storage. Vanadium dioxide is one of the few known materials that acts like an insulator at low temperatures but like a metal at warmer temperatures starting around 67 degrees Celsius. Excellent electrode materials should have fast lithium diffusion efficiency, high theoretical capacity, and good conductivity. However, it has proven difficult to find a material that meets all these qualifications. The emergence of 2D VS2 might make it possible to fulfill these requirements in one material. In a recent paper in The Journal of Physical Chemistry C ("Metallic VS2 Monolayer: A Promising 2D Anode Material for Lithium Ion Batteries"), researchers – by means of density functional theory computations – systematically investigated the adsorption and diffusion of lithium on the recently synthesized VS2 monolayer in comparison with MoS2 monolayer and graphite. "Intrinsically metallic, VS2 monolayer has a higher theoretical capacity (466 mAh/g), a lower or similar lithium diffusion barrier compared to MoS2 and graphite, and has a low average open circuit voltage of 0.93 V," Zhongfang Chen, an Associate Professor in the Department of Chemistry at the University of Puerto Rico, tells Nanowerk. "Our results suggest that VS2 monolayer can be utilized as a promising anode material for Li-ion batteries with high power density and fast charge/discharge rate." This work is a joint effort by researchers from the Center for Advanced Nanoscale Materials and the Department of Chemistry at the University of Puerto Rico, and the Key Laboratory of Advanced Energy Materials Chemistry (Ministry of Education) at Nankai University. "As a new layered inorganic material, VS2 provides us some basic principles for the enhancement in lithium intercalation and diffusion, as well as development guidance for new Li-ion battery materials," he adds. "Encouragingly, VS2 few-layers have been realized experimentally, and we strongly believe that 2D VS2 anodes with excellent electrochemical performances can be achieved in the near future." Since VS2 monolayers exhibit many properties similar to MoS2 monolayers, and its metallic property makes it superior to MoS2, VS2 monolayer materials are expected to be rather promising as electrode material in Li-ion batteries, supercapacitors and solar cells. Although VS2 monolayer is predicted to be a highly promising anode material for Li-ion batteries, the large-scale synthesis of high quality VS2 monolayers is still challenging. Chen says that stronger efforts should be devoted to developing more effective methods for the synthesis of VS2 monolayer.